The 3D Helter Skelter is the fourth building in a series of 3D ornaments that make up a fun fair at the ThreadABead Fairground. Always a favorite at the fair, the visitors have so much fun climbing to the top of the high tower and whizzing down the outside! The 3D Helter Skelter has been designed sit on a mantle piece as part of a fairground scene. 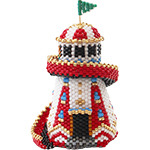 Made using Round Peyote the Helter Skelter takes around 6-7 hours to bead. As usual with ThreadABead featured patterns we give full detailed photographic instructions and in this pattern there are 98 detailed steps, making this pattern even suitable for beginners to beading. Please note the pattern may not work with any other size and type of beads. There are 12 colours in total and the finished beadwork is approximately 4cm (w) x 3.5cm (d) x 6.5cm (h). Wadding is required along with 1 x head pin and 1 x 8mm bead. A no tangle thread bobbin is useful. Additional tools used in assembly are round nosed pliers, cutters and flat nosed pliers. The bead pattern supplied is 34 pages and includes a full colour photo instructions and coloured pattern chart where needed.